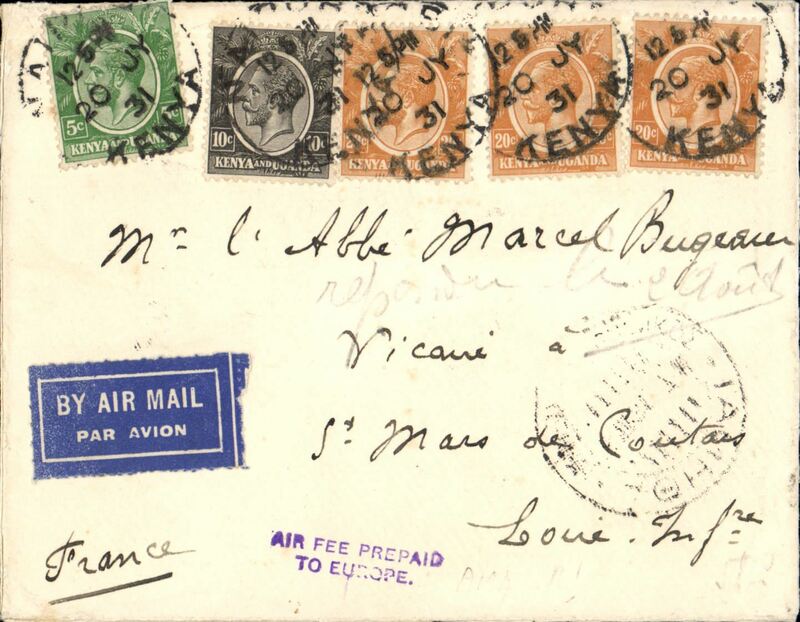 Description: BASUTOLAND acceptance of mail for carriage on the Highland Airways F/F Inverness to Kirkwall, scarce Type 1 "Orcadian Envelope" correctly franked 10d canc fine 'Kirkwall/11.15am/29 MY 34' scarce imperforate red/green/black oblong rectangular vignette. By air Kirkwall-Inverness, train to London, IAW flight AS 170 to Jo'burg, surface to Maseru, arrival ds on front, and redirected to Leribe, arrival 13/6. 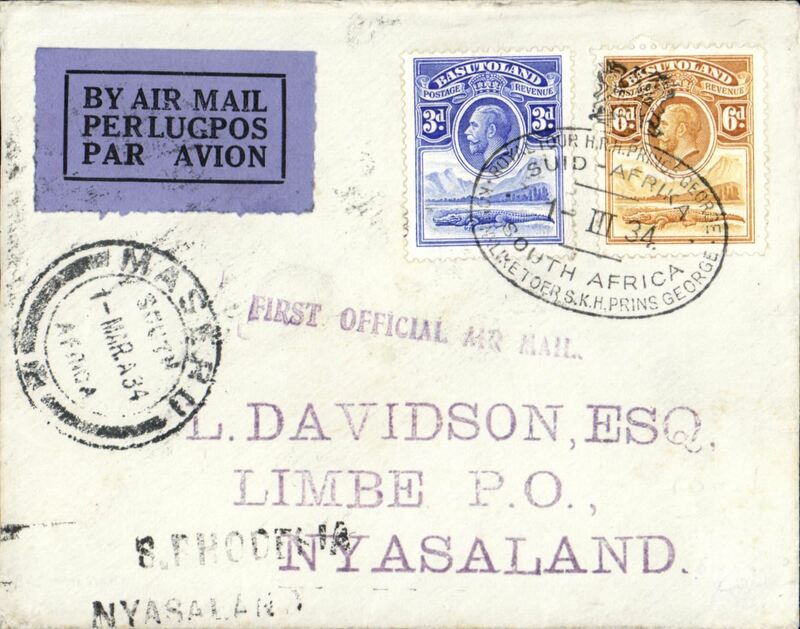 Orcadian F/F covers are SCARCE; Type 1 vignettes on F/F covers are RARE; and such covers carried to Basutoland are EXTREMELY RARE. The cover is in fine condition. 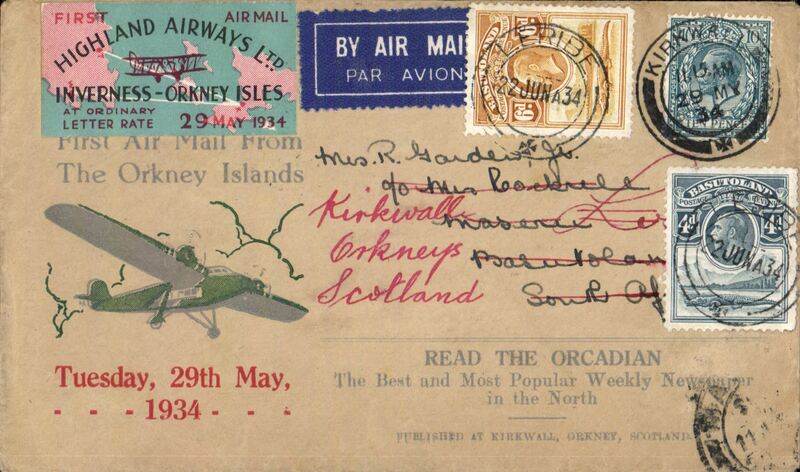 Description: Scottish Airways F/F KIrkwall to North Ronaldshay, bs 31/7, RARE Orkney Herald Type I souvenir cover with red plane but with blue fuselage and blue clouds missing, franked 1 1/2d canc Kirkwall cds, yellow/black/white Scottish Airways propaganda label verso. The missing blue fuselage and clouds is a variety, only have been recorded, see Redgrove p134. 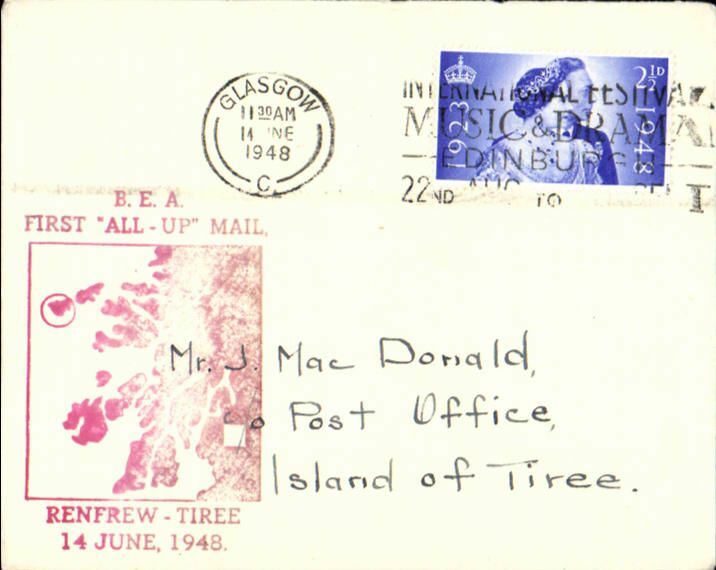 Description: A rare first BEA 'All Up' service, Renfrew Airport, Glasgow to the Isle of Tiree, the most westerly island in the Inner Hebrides of Scotland, plain cover franked 2 2/2d canc Glasgow 14 Jne 1948, large red "BEA/First 'All Up' Mail/Renfrew-Tiree/14 June 1948 with map of the islands. 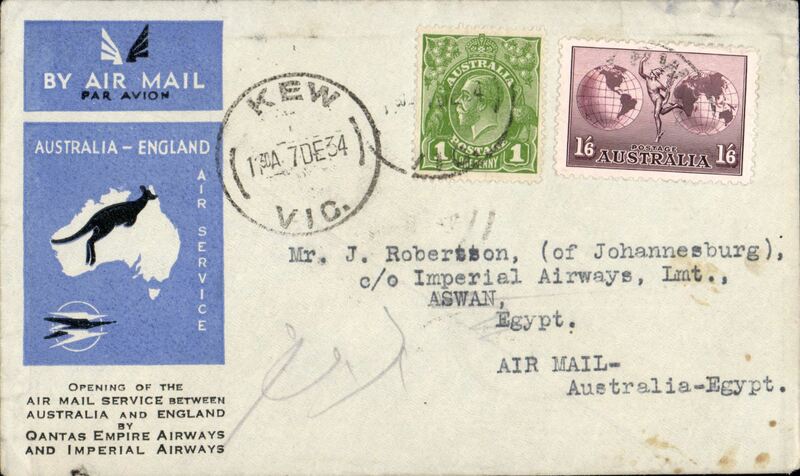 Beith states"little mail is known from the first day as the service was not well publicised". 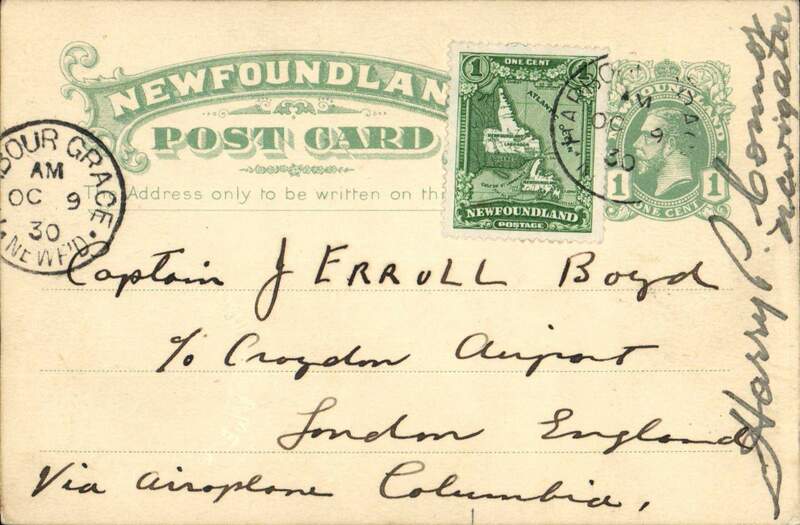 He reports having seen only ONE item of mail from this service. 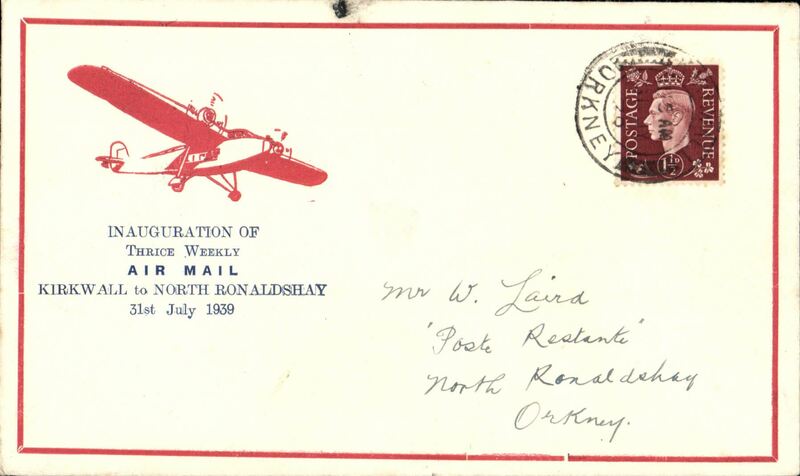 This was from this the outgoing flight , and it bore a red commemorative cachet (see Beith R, Scottish Air Mails 1919-1979, p22 and the illustration of the red cachet on the same page). 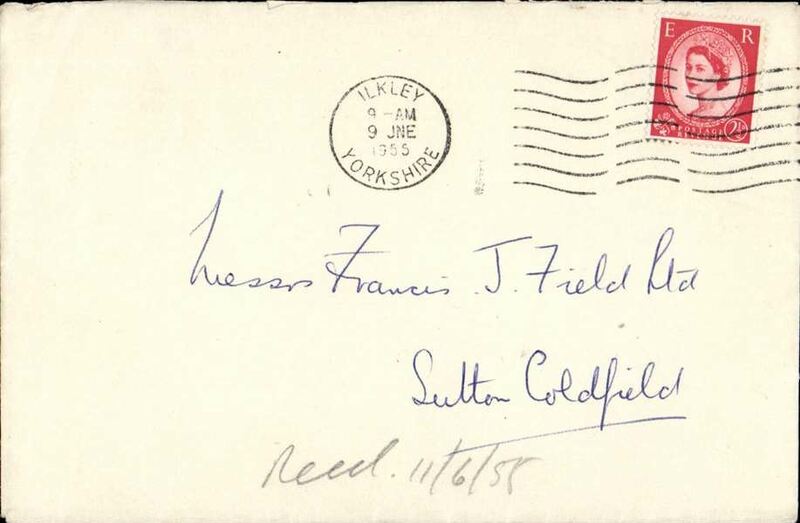 Description: Railway Strike Mail, cover fown fom Linton on Ouse to Northolt to Honiley, no arrival ds, plain cover franked 2 1/2d canc Ilkley/9 Jne 1955/ Yorkshire'.Rarely seen, ex Stratton. 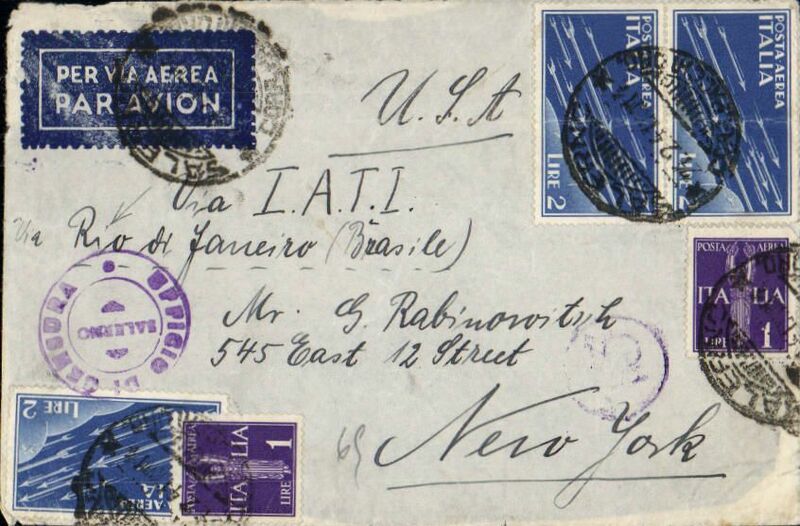 Description: Rare Italy to New York, double rate cover carried by LATI to Recife, then by ship to New York, censored airmail etiquette cover franked 8L on front, canc Salerno cds, with additional 9.5L verso, canc small remnants of rare three black "Par Avion Jusqu'a Recife" hs's, ms "Via Lati/Via Rio de Janeiro", ms '6g', sealed black/white Italian censor tape tied by violet circular Salerno censor marks. 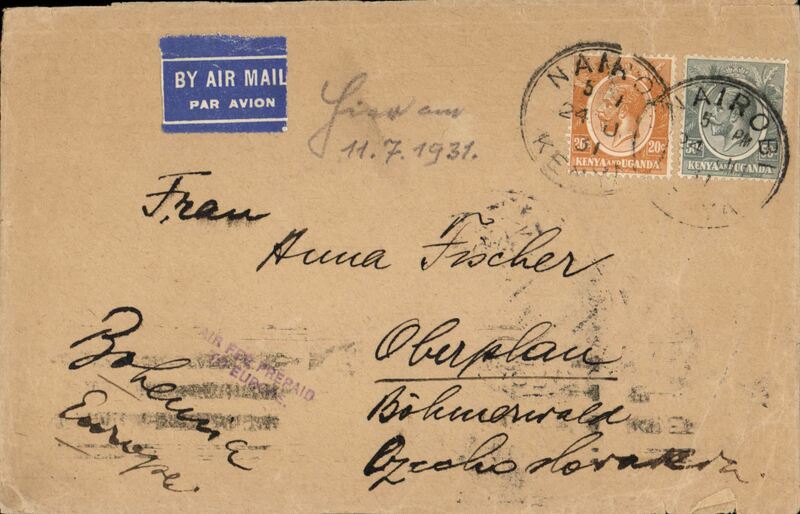 The "Par Avion Jusqu'a Recife" hs was used on Italian mail to indicate airmail to Recife, then ship to USA. 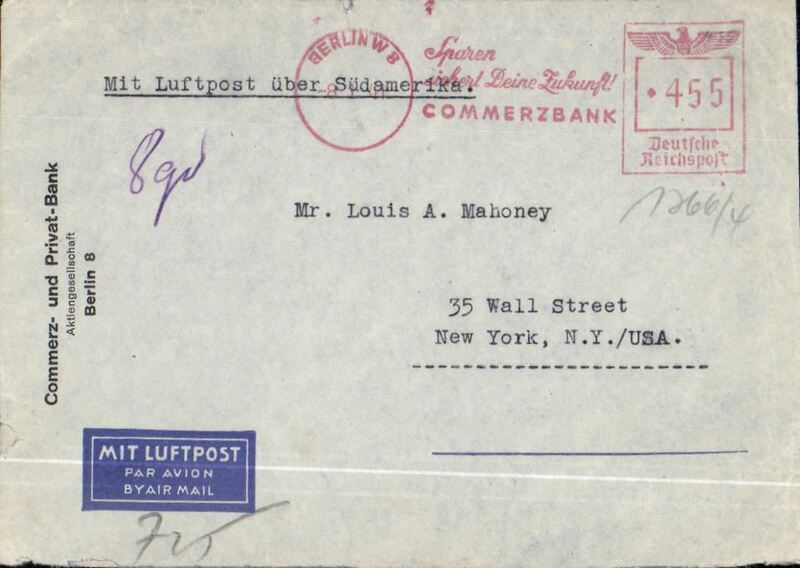 An extremely scarce LATI item, and definitely one for the exhibit.